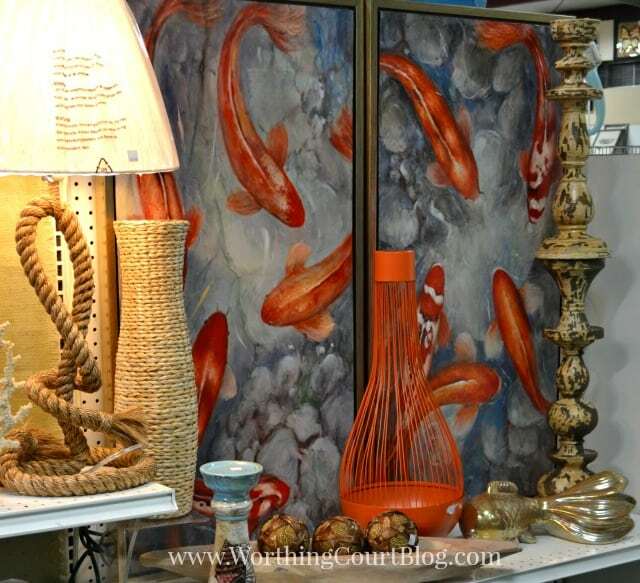 Do you have a favorite shopping haunt that stirs your imagination every time you walk through? I actually have several of them! One of them is New River Pottery in Wilmington, NC. I never miss a chance to stop by there when we’re at our beach condo. Grab your favorite beverage and let’s go shopping – virtual style, that is. 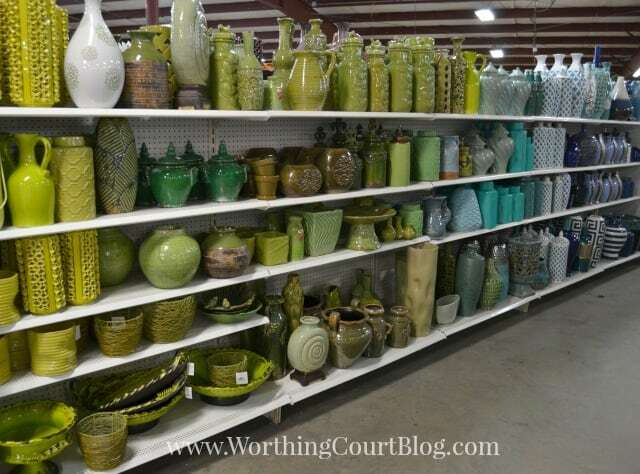 Don’t let the name fool you – this is not a pottery shop. 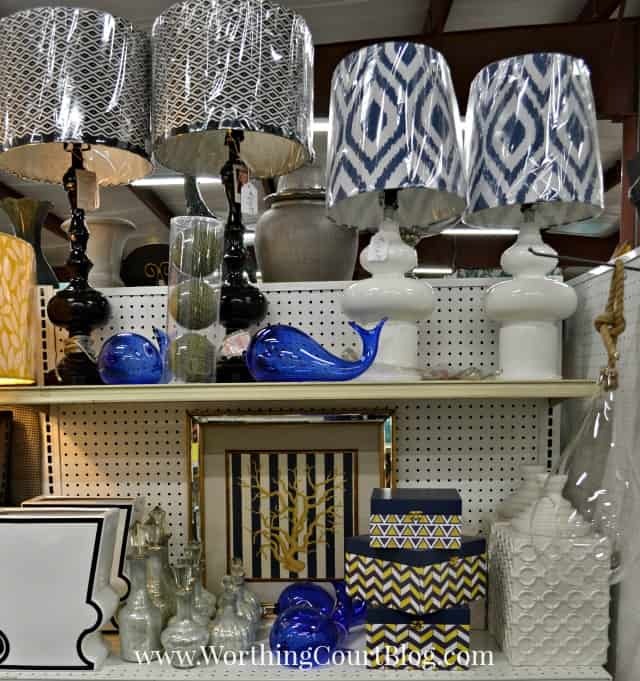 It is one stop shopping for all things home decor. I picked up a few things while I was there, but I spotted a couple of things that I overlooked as I was editing my photos. Drat! 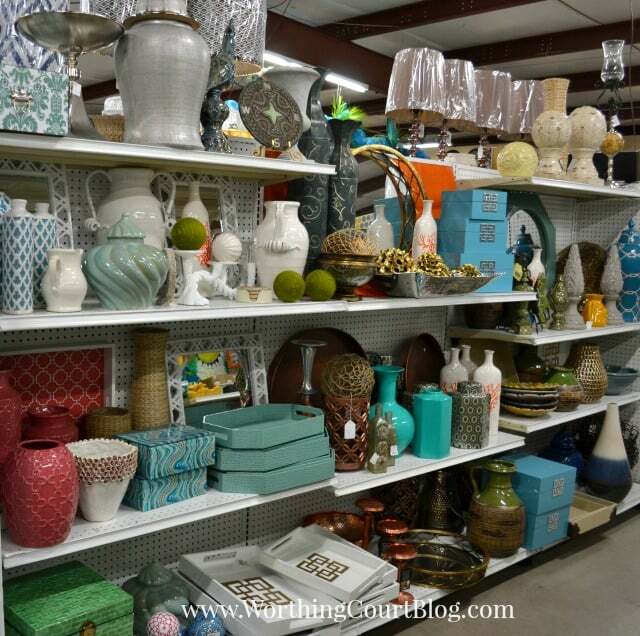 Unlike some stores, where they aren’t good about carrying current products, the items at New River Pottery are always on trend with what I see on the latest home decor websites. I’d say that their prices are about the same as they are at HomeGoods – maybe a little less. A couple of these gold orbs jumped into my buggy when I wasn’t looking. 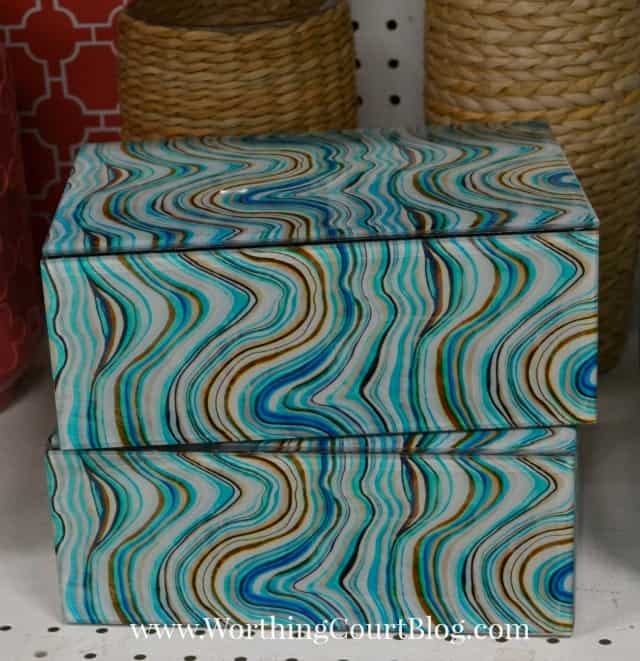 I didn’t buy one, but I thought these boxes were pretty awesome. 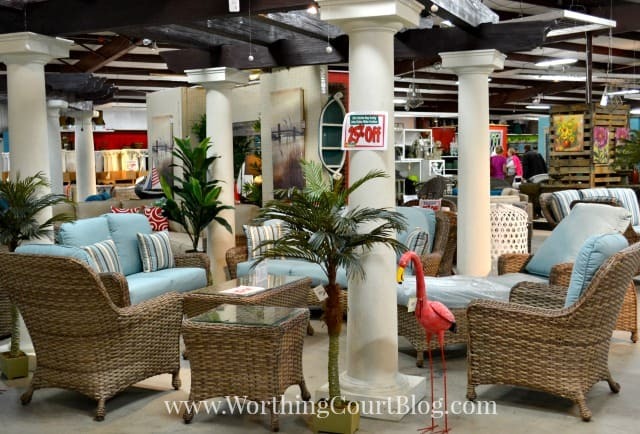 You might think that what they sell would skew heavily toward beachy decor since they are located in a coastal town, and while they do sell those types of things, they have a very wide variety of everything else too. I always come away from here totally inspired. Sometimes my shopping cart is full too! 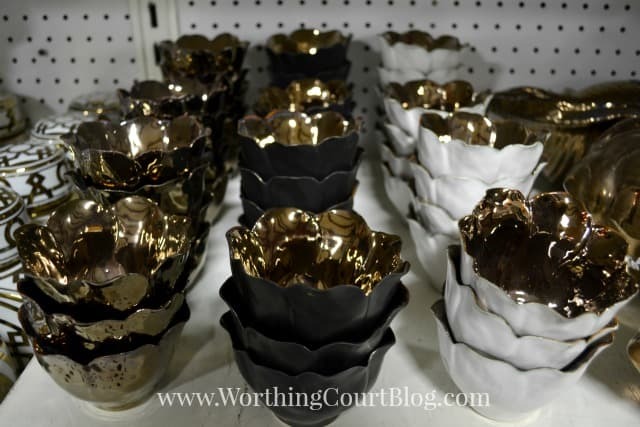 I love these small lotus bowls with their gold interior. I picked up one of each for my daughter. I couldn’t think of any place to use them at my house. And do you see the gold and white canisters to the left? She wanted a couple of those too. You might have seen the picture that I posted of them on Instagram. They had a lot of white to choose from. 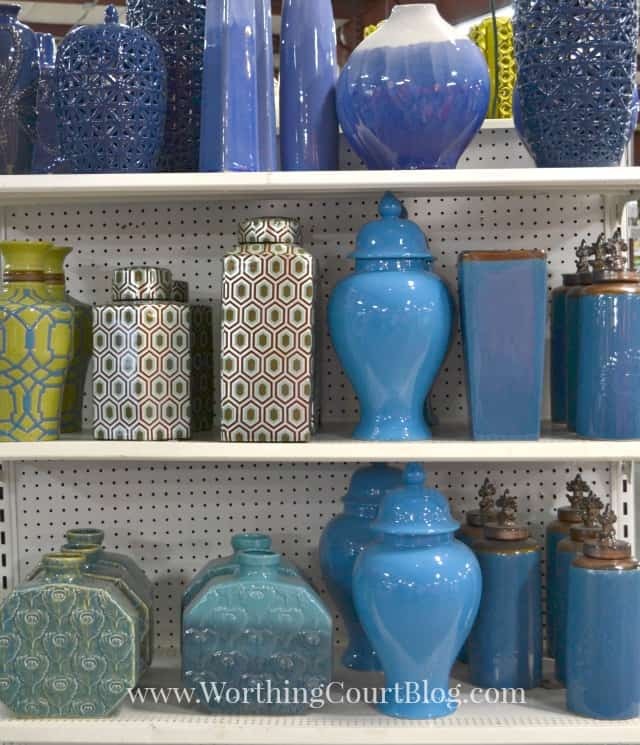 Loved this pale blue urn, but nope, didn’t buy it. 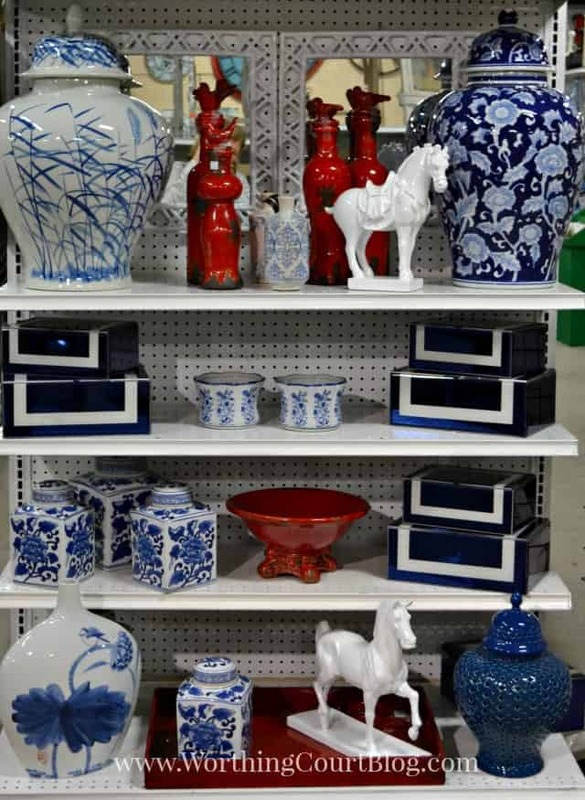 Patterned and blue urns and jugs. 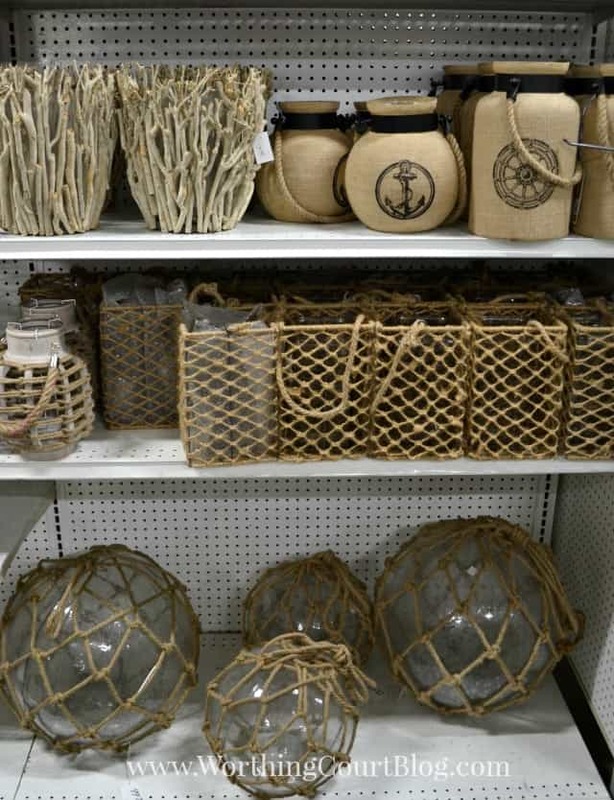 Burlap, driftwood, rope and fishing floats. 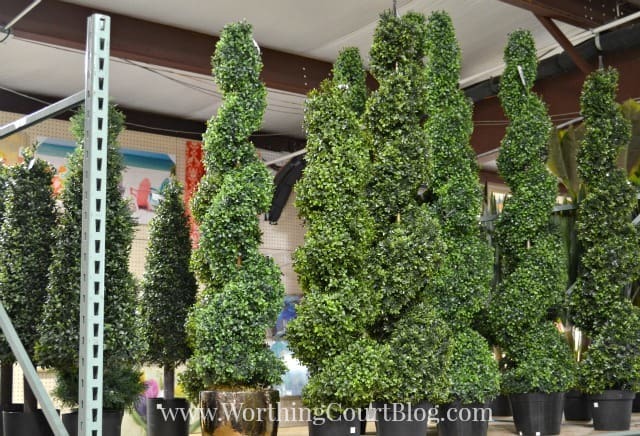 Anyone want a boxwood topiary? 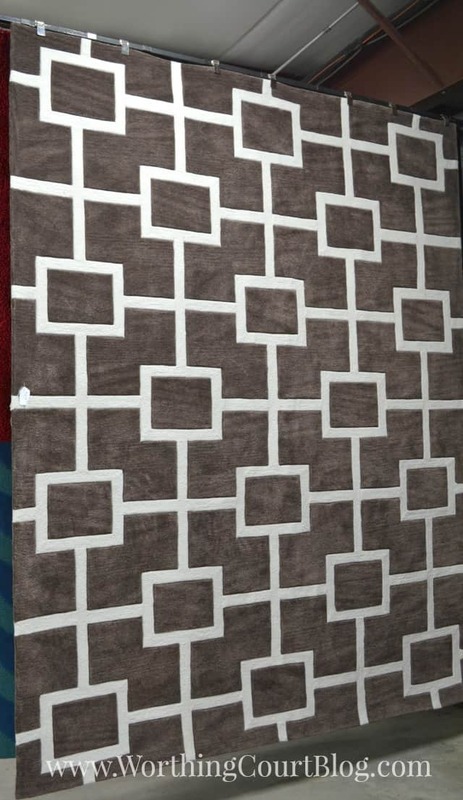 How about a rug? They had a fairly large selection. All of that was just a part of what is in the front half of the building. The back half is a Christmas wonderland starting at the end of the summer. Right now, it has everything you could ever want for outdoor living. 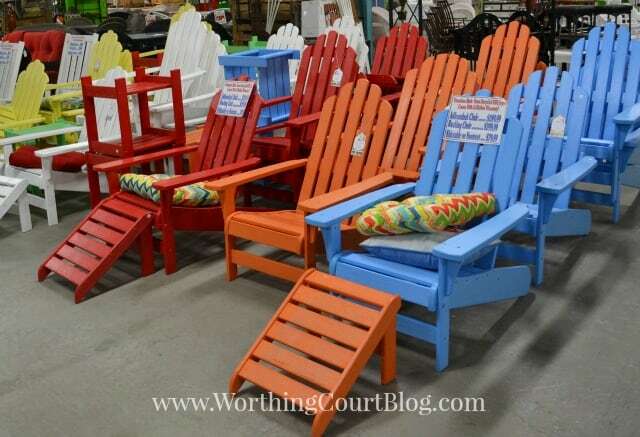 They had every kind and color of outdoor cushion imaginable. Too many for me to try to get a good photograph of. Love, love, love this bench design. I could go on and on, but this post is already too long. Just take my advice and do your best to stop by New River Pottery if you’re ever in the vicinity of Wilmington, NC. It’s a stop well worth it. Oh – and make sure to wear comfy shoes! 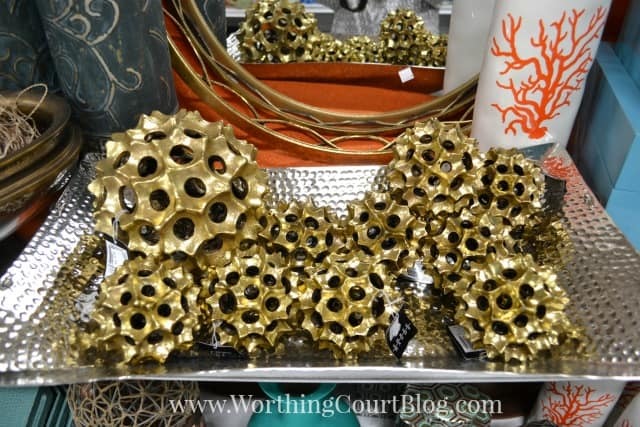 WOW….they do have a lot of neat things! 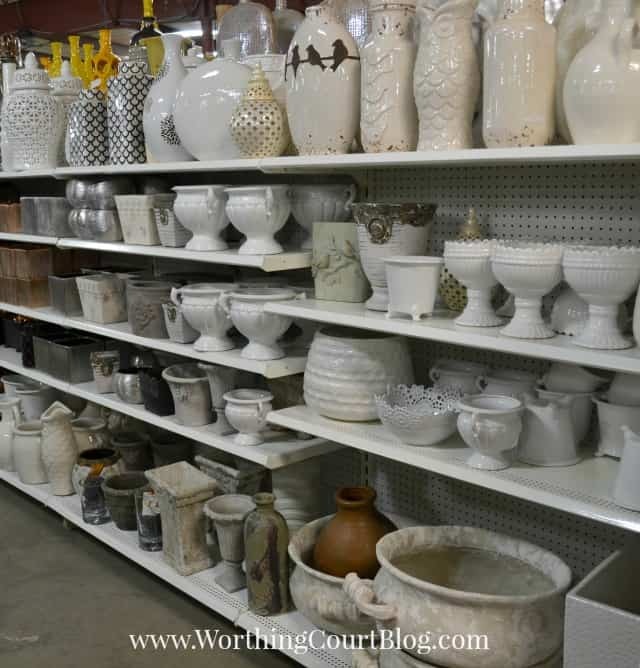 Kind of like an Old Time Pottery…but better! It’s WAY better! There’s an Old Time Pottery in Wilmington too and what they have doesn’t compare to New River Pottery. Thanks so much for the field trip! Wishing there was one of these stores in my area! It’s worth taking a little trip if you’re anywhere near there, Ashley. 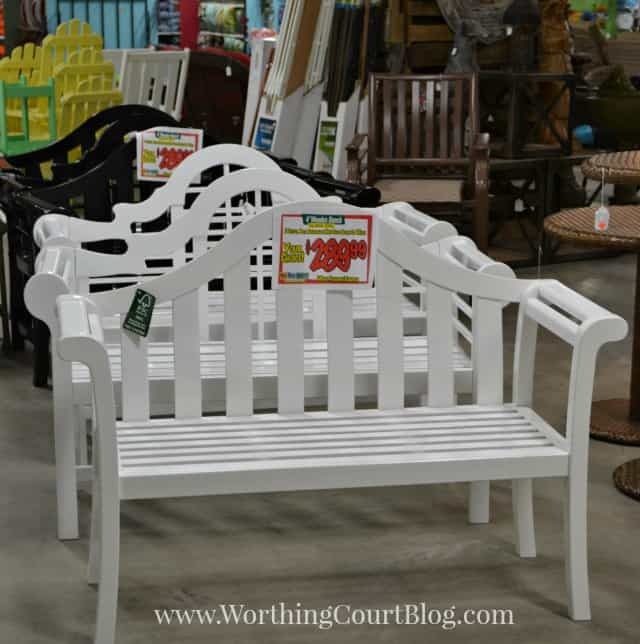 I could totally see you diy’ing a bench! Boy would I ever love to have one of those near by. We have nothing around here. I can just imagine what kind of inspiration you’d get walking through there. I love that garden bench. I loved that garden bench too and stared at it for the longest time trying to figure out where I could use it, but I couldn’t think of any place. Hope you can make it to the store one day! Hi Terri. Sorry for my late reply! I’ve heard of Ivy Cottage, but I’ve never been there. I will definitely check it out this summer! Ooooh – I ADORE Southport and never miss an opportunity to eat at Provisions – best conch fritters and grouper salad ever. I love to sit in the covered outdoor area and enjoy the boats pulling up the their dock to come in and eat. It used to have a wonderful view of the entrance to the Cape Fear river, the ocean and the inland waterway, but they ruined a lot of it when they build the condos. :/ I finally toured the Christmas house last summer and was amazed at what a huge selection they had! Something for everyone. I know I am late visiting, but I didn’t want to miss the chance to tell you I love this place, too. Actually, I love both places. We are going in a few weeks, and I will be making my visit. Can’t visit the area without leaving some cash there. Hi Beverly. I know what you mean – I usually leave way more cash there than I intend to! What other place are you referring to – Ivy Cottage maybe? 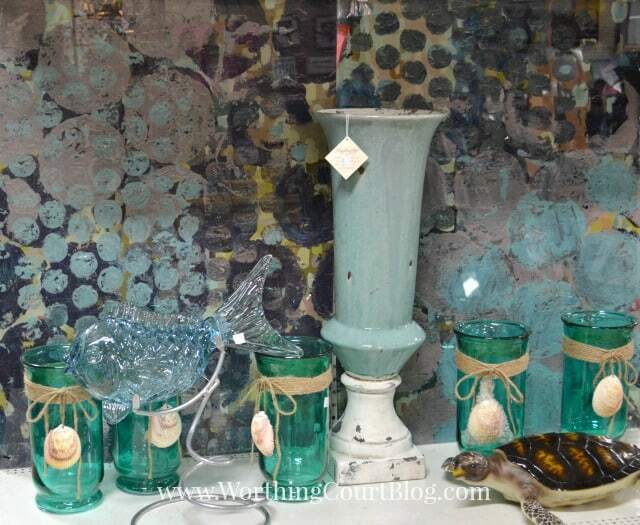 I’ll be posting about another cute shop that I discovered in Wilmington soon – hopefully next week.